Since the first shots rang out at Lexington and Concord, signaling the beginning of open war between the colonies and England, America has been credited with a singular conviction, a concern for military veterans' and others' economic and political rights. The idea of America as a promised land of economic opportunity, social mobility, and political freedom has not always flourished. Historians have both given it reality and shaken its substance as they exposed an undercurrent of greed, class conflict, and corruption. 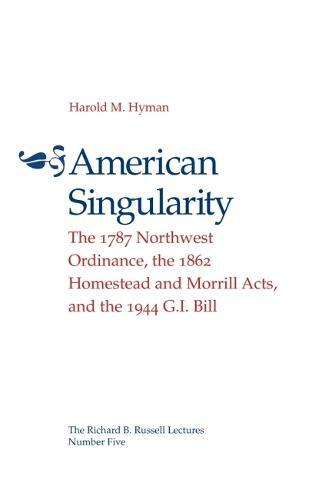 In this book Harold Hyman explores the question of American singularity, using the Northwest Ordinance, the Homestead and Morrill acts, and the G.I Bill to measure individual access to land, education, and law. The Northwest Ordinance, enacted in 1787 to encourage settlement of the nation's untamed territories, mandated the establishment of public schools and stable property rights in newly settled lands--specific terms which enshrined the basic liberties secured by the Revolutionary War. Hyman shows that through the Homestead and Morrill acts of 1862, legislators sought to preserve the values of the Union and to prepare for the entrance of the black man into citizenship. Equal access to public lands in the West and to state land-grant universities, countered the economic and social injustices blacks and poor whites would face after the Civil War. Finally, Hyman asserts that the G.I. Bill preserved beneficial social programs forged during the depression, carrying into post-World War II America a widespread concern for education and housing opportunities. Examining the legislation that emerged from three periods of conflict in American history, Hyman reveals a consistent pattern favoring equal access to land, education, and law--a progression of singular, if sometimes flawed, attempts to embody in our statutes the values and aspirations that sparked our major wars.